I had a very enjoyable day today, driving a number of buses on the Driver Training Centre network of roads at Westpoint, Exeter. Organised by the Westcountry Historic Omnibus & Transport Trust (WHOTT) for its supporters, it was an opportunity to try out a wide range of vehicles in the relative safety of a private estate. Those taking part went out in groups of 3 or 4 for a 45 minute session in one of their chosen buses, working through the day so that we could drive up to five of the buses in WHOTT’s care. We usually managed 10-15 minutes in the driving seat. I started off in LTA 722, an ex-Southern National 1950 Bristol LWL5G. The first gentleman to have a go really struggled with the crash gearbox, making horrible noises. In all of his time in the cab, he didn’t manage to change up to 3rd gear once. The driving supervisor, shouting advice through a small porthole above the driver’s head, tried all kinds of advice but to no avail. It was my turn next and I climbed up into the cab with the supervisor’s words ringing in my ears, “You’ve driven Lodekkas before, you’ll be alright!” I hope I didn’t disappoint him as I went smoothly up the box. We chugged around the training track, negotiating traffic light junctions, mini-roundabouts and 6 other buses doing the same. I messed up one gearchange, going from 3rd to 2nd. I think I must be used to the slower change on the Lodekka’s 6-cylinder engine. All too soon I had to hand over to the next ‘victim’. Regular readers will have noticed a deafening silence on this blog on the topic of training to be a bus driver. The fact is, I’m waiting for a call from my instructor, who is currently preoccupied with office duties. I’ve passed all the theory modules of the PCV test and I’m now due to have practical training with two of my mechanic colleagues. So it’s a case of waiting by the phone. Metaphorically, of course. Next up on the radar is the WHOTT ‘Drive It’ day which is this weekend. I’ve signed up to drive up to four of the heritage buses in their collection so news of this event will be posted sometime next week. Another photo from my archives, showing Bristol LS6G OTT 98 arriving at Torre Abbey, Torquay in 1990 on the occasion of the Agatha Christie Centenary celebrations. 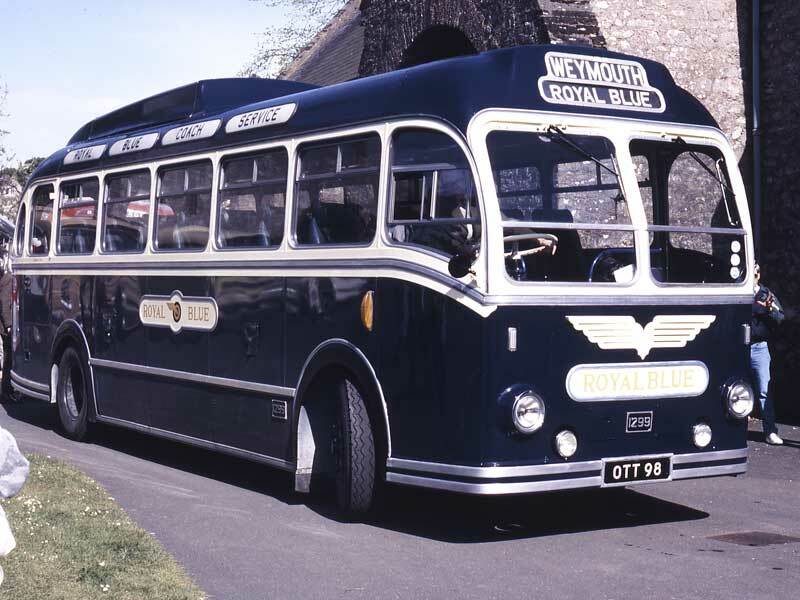 OTT 98 was delivered to Southern National in 1953 for their Royal Blue fleet and, at the time this photo was taken, was owned by the Dorest Transport Circle. It attended Torre Abbey along with a number of other forms of historic transport including cars and commercial vehicles. Not far from the spot where I took this photo stands Torquay railway station, once owned by the mighty GWR. Later that same day, a delightful Christie cameo was played out as a luxury Pullman train arrived at the station. Among the guests stepping onto the platform to attend the Christie celebrations was a certain Hercule Poirot (David Suchet). He was observed to walk up to a lady of advancing years, tip his hat and present a bouquet of flowers to none other than Miss Jane Marple (Joan Hickson) before they were both taken the short distance to Torre Abbey in a vintage Rolls Royce. OTT 98 is now owned by the Westcountry Historic Omnibus & Transport Trust and can often be seen attending rallies and special events. I hope to be driving this vehicle in 2 weeks time when it, along with others from the WHOTT collection, take part in a “Drive It” day when friends of the Trust can drive a selection of historic buses from the Trust’s collection on a private network of roads. If all goes well, I hope also to drive an Exeter Corporation Leyland PD2 and a Southern National Bristol LWL. So, having inherited a love of all things vintage, I am determined to pass on my passion to a new generation. 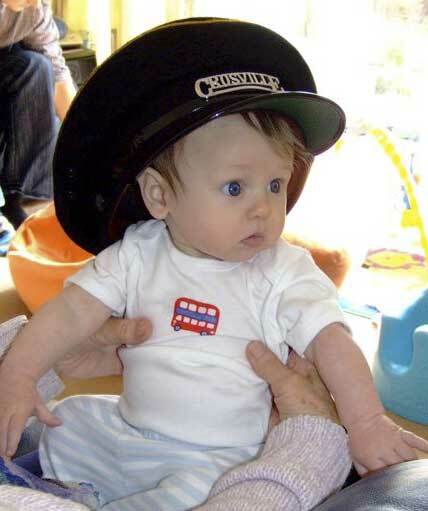 Pictured below is my grandson, trying on my Crosville cap for size. He may need a few more years to grow into it but I’m sure it won’t be long before he can experience the delights of a ‘proper’ half cab bus, driven by his Grandad! I’ve written before about what kindled my interest in vintage transport. That should more properly be ‘who’ because it was largely my father’s interest in anything to do with all forms of transport that rubbed off on me. He would often sit me in the saddle of his extremely loud (to me, as a 3 year old lad) single cylinder motorcycle as it sat in the back garden. He would take me down to the railway station at Salisbury to watch the fast-disappearing steam hauled expresses. Then there were the buses. Big, red and lumbering. I loved every journey. One day we both took a ride, just for the fun of it. We took the Wilts & Dorset number 61 from Wilton Road into town and then took the number 59 ( I think) up to the end of Devizes Road. Like most of the town services in the early 1960s, it was operated by one of many Bristol Lodekkas. There the bus would lay over until it was time to return from whence it came.